Netanyahu says Israel 'will not allow continuation of rocket fire,' after morning of rocket attacks against southern communities. Prime Minister Binyamin Netanyahu responded Monday to the barrage of 15 rockets since Sunday night, which Israel said were fired by Hamas terrorists for the first time since the 2012 Operation Pillar of Defense. Speaking in a Security Committee discussion, Netanyahu said "we are defending ourselves from the (rocket) firing attempts and firing towards Israel; yesterday we hit a Hamas terror cell that fired rockets." "I say in the clearest way possible, if the quiet that was achieved after Operation Pillar of Defense will be breached and the firing continues, there are two options - either Hamas will stop it, or we will stop it. 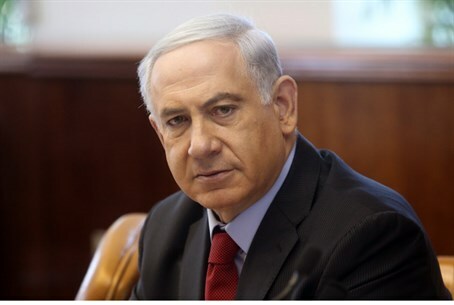 We will not allow the continuation of this (rocket) firing," said Netanyahu. Hamas Deputy Leader Moussa Abu-Marzouk revealed on his Facebook this week that Hamas has given the rocket launchers a free hand, not arresting a single one in the recent escalation since Hamas terrorists kidnapped three Israeli teens on June 12. If Hamas indeed is behind the rockets, Abu-Marzouk's statements apparently downplayed Hamas's role in the rocket fire. The comments come as Senior Hamas official Izzat al-Rishk threatened Netanyahu on Monday, saying the prime minister can decide to start an escalation today, but "he doesn't have the ability to stop it tomorrow." Al-Rishk went on to claim Israeli airstrikes in response to the rocket attacks in recent days are a "desperate" measure to cover the "Israeli failure" in the investigation of the three teens who were kidnapped by Hamas terrorists on June 12. Speaking about Operation Brother's Keeper, which seeks to rescue the kidnapped teens and destroy the Hamas terrorist infrastructure in Judea and Samaria, Netanyahu said "our primary goal was and remains to return the boys home." "The order to the IDF is not to save any means in order to achieve that goal," added Netanyahu. As part of the operation, IDF forces raided the home of Marwan Kawasmeh (29) on Sunday night, who was identified by the IDF last Thursday as being behind the kidnapping along with fellow Hamas terrorist Amar Abu-Eisha (33). Reports add that a car belonging to Kawasmeh's family was seized, and searches were conducted in several Hevron homes including those in the Kawasmeh hamula (family clan), with family members of the terrorist being interrogated.